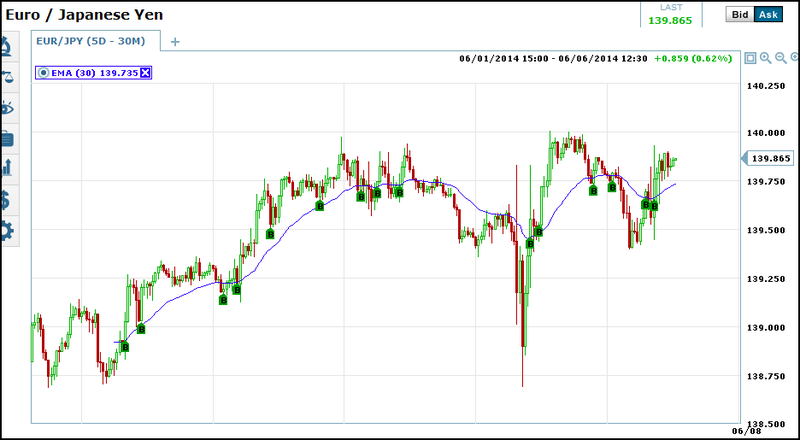 I learned a long time ago how to judge the duration of a given signal, well before I began trading binary options. The method I will describe is just as effective, even more so in some regards, for binary trading as it is for standard equity options. The first thing to do is to identify what your signal is. Is it a trend line bounce, a stochastic crossover, a shift in momentum, a candlestick pattern or a variety of signals as if the case with most profitable strategies today. Then, you go back over your charts for a given period and identify all the signals. It doesn’t matter what time frame you are using, this technique works in all. Once you identify your signals mark the strong signals and weak signals and then count how many bars or candles it takes for each signal to move into the money. Once that is done you can take an average of the number of bars needed for the strong and for the weak signals to move into the money. These averages are now your base line expiry for you signal. If you are using a chart of hourly prices and your signal takes an average of 3.7 candles to move into the money you will want to use an expiry that coincides with that time. This could be a mid day, end of day, 4 hour or other option with an expiry that matches your signal horizon. If the signals takes 3.7 candles and you are using a daily chart that means 3.7 days, if the hourly chart 3.7 hours. Let’s look at the chart below. I am going to use a basic moving average strategy to illustrate my point. I will use the 30 bar exponential moving average because it hugs prices closer than a simple moving average and will give us more signals to count. Also, in order to weed out bad signals and to, hopefully, improve results, I am only choosing the bullish trend following signals. So, there are 15 total signals; 6 weaker signals and 9 stronger signals. On average, it takes 4.2 bars for these signals to move into the money and PEAK OUT. That means, since this is an hourly chart, that each signal will move into profitability and reach the peak of that movement in about 4 hours. So for expiry I would want to choose the closest expiry to 4 hours that is available. If a good choice is not available then no trade can be comfortably made. Breaking it down a little the weak signals peak out in about 2.6 hours versus the stronger signals which take about 5.3 hours. Putting this knowledge in perspective, a weaker signal might be one that is close to resistance. A stronger signal might be one that is not close to resistance. Also, a stronger signal might be one where price action makes a long white candle and definitive move above or from the moving average whereas a weaker one might only create small candles and spinning tops. Choosing expiry is one of the most important factors in making a trade. The other most important factor being direction. All too often I get asked questions about why a trade went bad in the final moments and one of the most common areas of error I find is in choosing expiry. Of course there are the errors in analysis that result in counter trend trading, the random bits of news that can reverse a market in a heartbeat and many other reasons why a trade can go bad but the focus of this discussion is expiry. It is obvious that you don’t want to use 60 second expiry when trading on weekly charts and you won’t want to use end of day expiry when trading off the 60 second charts but just how do you determine what the best expiry will be? One question you must ask yourself is if you are trading with or against the trend. When trading against the trend I would suggest a shorter expiry than a longer one simply because there is less chance of an extended move counter to the trend; your expiry must be more precise. When you trade with the trend your expiry can be a little farther out. A trend following trade has a higher likelihood of closing in the money so don’t need to be as precise. A signal that follows the trend is a lot more likely to be in the money an hour, a day, a week or a month from now than one that goes against the trend. Another factor that can have a big impact on which expiry is best for a given trade is support and resistance. The relative level of prices to a support or resistance line is a factor in how likely a trade is to move in a given direction. If prices are near a S/R line and moving away there is much more chance of your option closing in the money than if prices are near a S/R line and moving toward it. When prices are moving toward one of these lines the chances of the movement being halted and/or reversed is much higher than when prices are moving away from one. So, how does this apply to expiry? If you are taking a signal that has a higher chance of being halted or reversed then you would want to choose a shorter expiry than if the same signal were not faced with a S/R level. I purposefully did not say call or put, or bullish or bearish, because this applies to both bullish and bearish trading. Also, keep in mind that support and resistance can be in the form of lines drawn at areas of interesting price action or peaks, moving averages, Fibonacci’s, envelopes and bands. Quietly Moving Up The Ranks, Buy This Token Now! The information on this site is for general information purposes only and does not claim to be comprehensive or provide legal or other advice. The views expressed in contributor articles or on the forum are expressed by those contributors and do not necessarily reflect the views of BinaryOptions.net. Articles and other publications on this site are current as of their date of publication and do not necessarily reflect the present law or regulations. BinaryOptions.net accepts no responsibility for loss which may arise from accessing or reliance on information contained in this site. BinaryOptions.net is not responsible for the content of external internet sites that link to this site or which are linked from it. USA REGULATION NOTICE: Please note if you are from the USA: some binary options companies are not regulated within the United States. These companies are not supervised, connected or affiliated with any of the regulatory agencies such as the Commodity Futures Trading Commission (CFTC), National Futures Association (NFA), Securities and Exchange Commission (SEC) or the Financial Industry Regulatory Authority (FINRA). We warn US citizens of the dangers of trading with such entities and strongly advise that they take legal advice on this in the US.